Colt and I started making a salad very similar to this years ago when Lorna was about a year old and we wanted to enjoy a Valentines Day dinner date but choose to stay in. Sometimes to lay the kids down to sleep and put a little makeup on when they were little was so much easier then trying to find a sitter and worrying if they were ok through out our date. 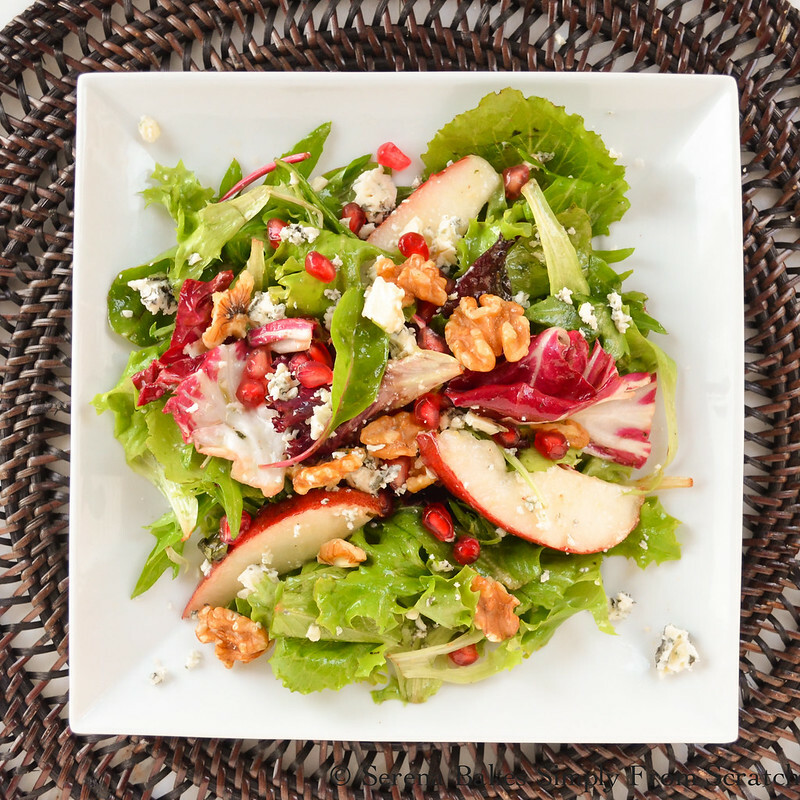 Our menu usually consisted of delicious flavor combinations we would order if we had gone out and the Savory Pear Pomegranate Gorgonzola & Walnut Salad with White Balsamic Vinaigrette was born out of a necessity to step away as Mom & Dad to become Husband & Wife in the comfort of our home. 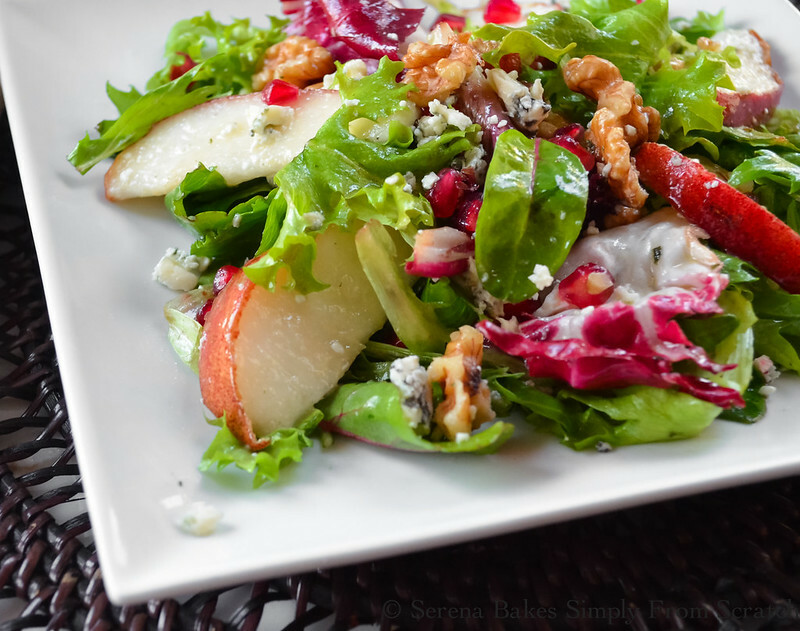 The sweetness of the pears & sweet and sour pomegranate combined with the buttery bite of the gorgonzola, earthy rich crunch of walnuts with a light creamy white balsamic vinaigrette to round out the flavors to pull the salad together as one of our favorites. It was this flavor combination that made Colt start to love bleu cheese. This salad pairs deliciously with grilled chicken for a light dinner or lunch. Most of our dates in the last year have been dinner in with the kids at their Aunts or Grammies and us at home cooking dinner together learning to truly enjoy our time alone. It was a slow road to learn date nights didn't always have to include a fancy dinner and a show but sometimes a simple and delicious dinner at home alone in the silence of our busy day to day lives is refreshing and rejuvinating. For the Cream White Balsamic Vinaigrette combine white balsamic, extra virgin olive oil, sea salt, pepper, honey and water into a blender. Blend until creamy. Dressing can be stored in the refrigerator for later use. 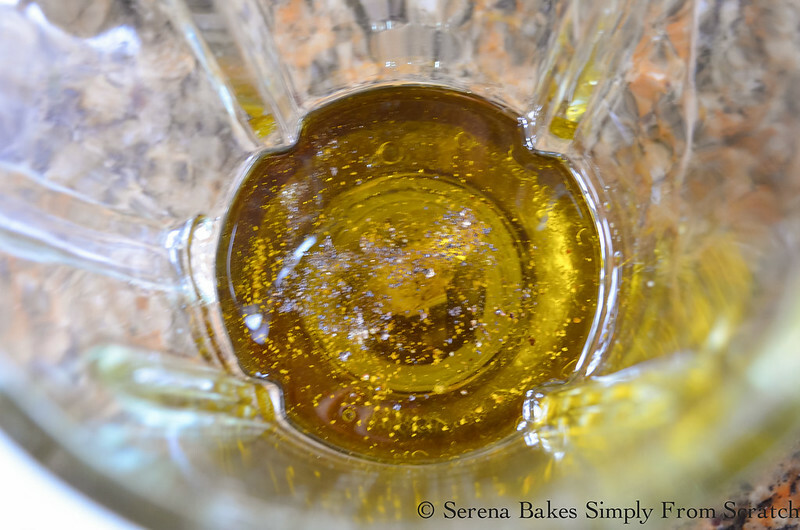 If olive oil separates and hardens allow dressing to come to room temperature and blend again until creamy. 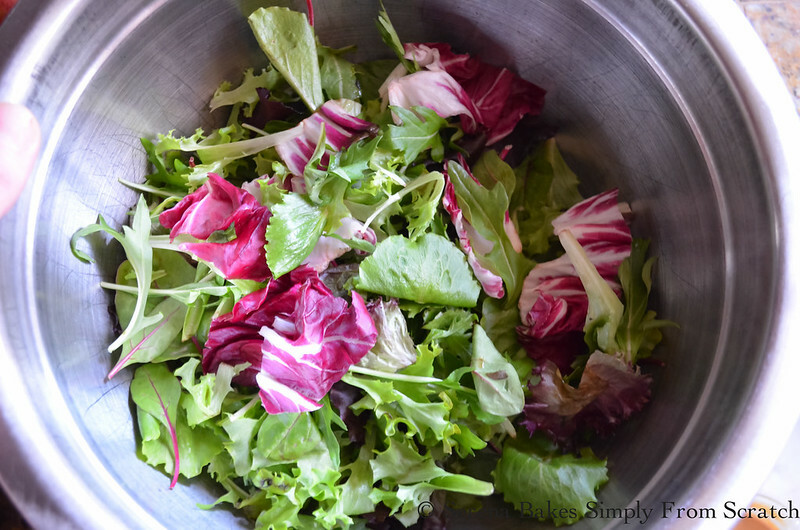 Wash salad greens well and dry. We used mixed baby greens but baby kale or a super baby greens would taste amazing also. 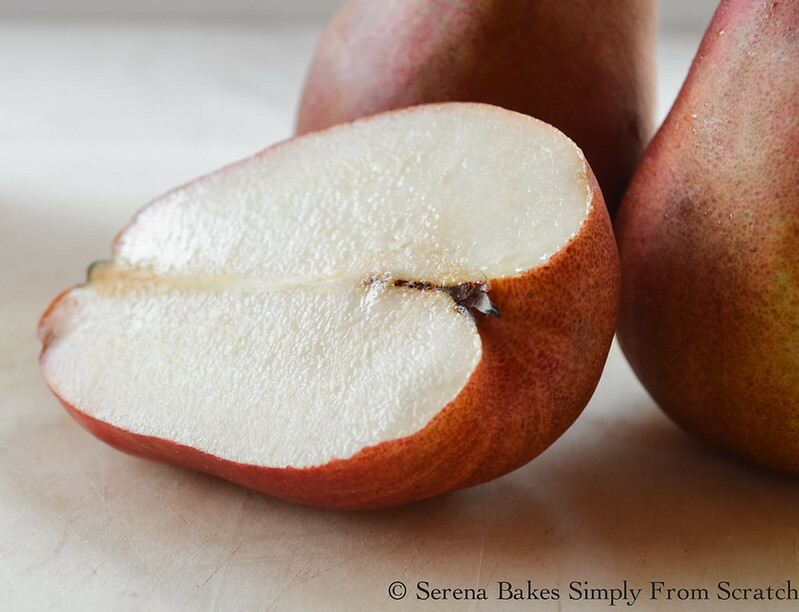 We used Red Anjou Pears for their gorgeous red skin but any soft ripe pear will work. Slice pears thin and remove core. 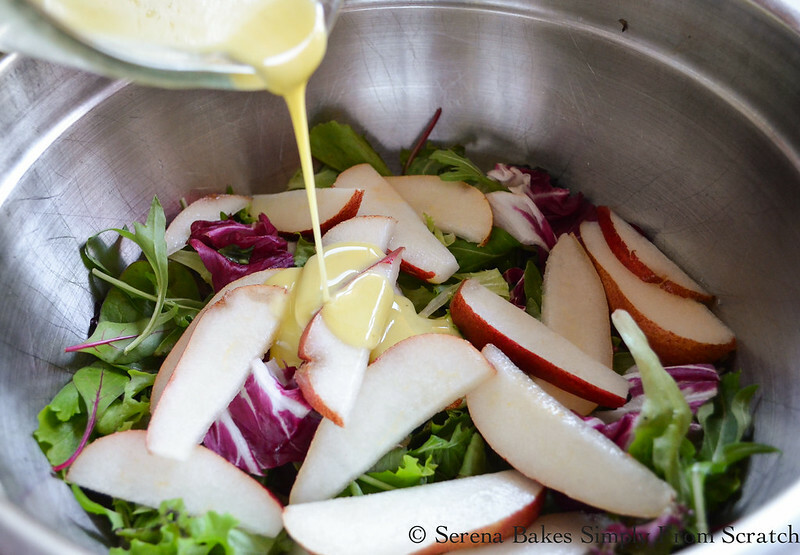 Drizzle pears and salad with the creamy white balsamic vinaigrette. Toss to coat pears well. This will help to prevent pears from browning. 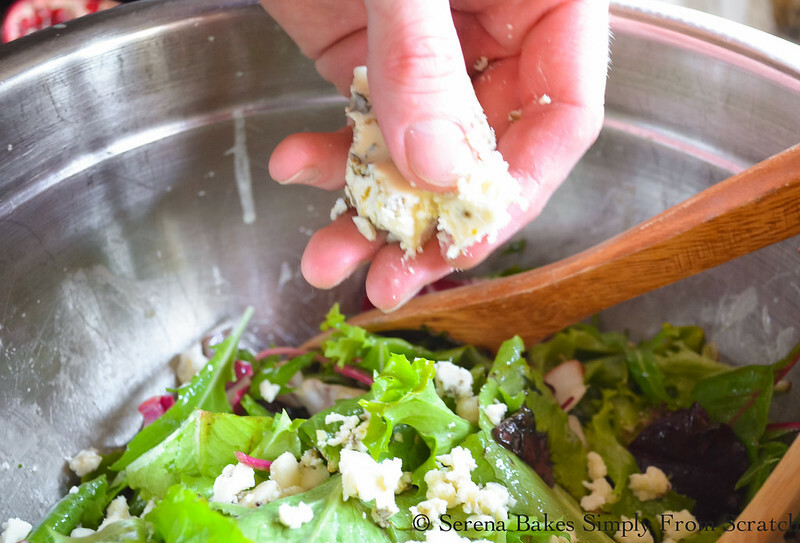 Crumble gorgonzola into salad and toss until well combined. 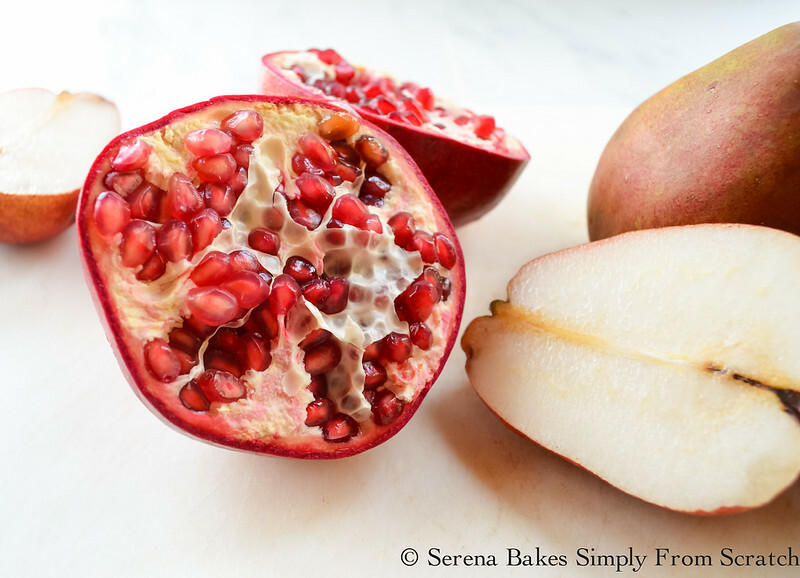 Serve salad and sprinkle with pomegranate seeds and walnuts. My idea of a perfect salad. 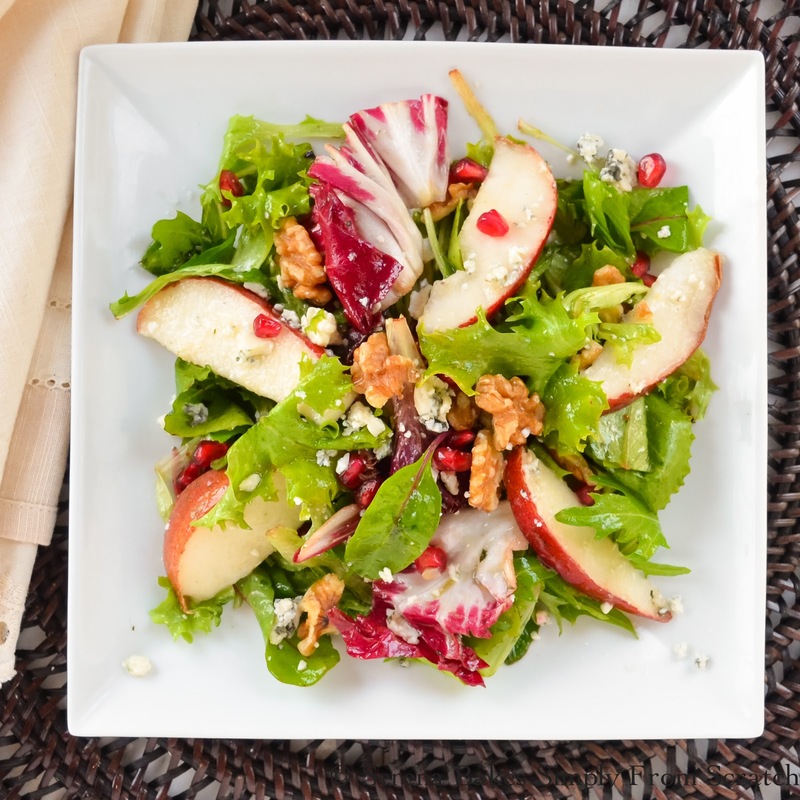 The sweetness of the pears & sweet and sour pomegranate combined with the buttery bite of the gorgonzola, earthy rich crunch of walnuts with a light creamy white balsamic vinaigrette to round out the flavors and pull the salad together as one of our favorites. Recipe includes step by step instructions with photos. In a blender combined white balsamic vinegar, extra virgin olive oil, water, sea salt, pepper and honey. Blend until creamy. Add salad greens and pears to a large bowl and toss with desired amount of dressing to coat pears to prevent browning. Add gorgonzola, pomegranate seeds, and walnuts. Toss well and serve. This sounds just delicious Serena. I love a good salad. The colors are so pretty! This salad is so vibrant in color, what a beautiful dish!